There are a few things that my son (age 2.5) absolutely loves and can't get enough of. When it comes to television, one of his favorites is Signing Time. I lived with a deaf roommate for three years in college and learned ASL. It became a language I loved - and was happy to find out about Potty Time once I had my baby boy. I have always loved Rachel Coleman's family story. Rachel is the co-creator of Signing Time and was very much involved in the music world singing and playing guitar in a folk rock band. However her world soon changed when she had a daughter, Leah who was born deaf. A few years later, she had another daughter, Lucy who was born 8 weeks premature with spina bifida and cerebral palsy. This amazing mother and her sister decided to create Signing Time. For the full story, please visit the official Signing Time blog. Therefore, when I was given the chance to review Potty Time for Tight Wad, I jumped at the opportunity. This video is as wonderful as the other Signing Time videos. Today during lunch, my son and I listened to the music CD included with the DVD. I just put him down for a nap and I can hear him saying, "My body is amazing!, Amazing!" - which is one of the songs included in the DVD/CD. This video teaches little ones to start paying attentions to their bodies. Their body tells them when they are tired, hungry or thirsty - and when they need to go to the potty! Rachel also uses three familiar characters in this video: cartoon versions of Leah, Alex and the adorable little frog, Hopkins that she uses throughout the Signing Time series. It teaches them to celebrate successes but that accidents are also very much a part of potty training. Because my son is familiar with most of the Singing Time series, he already knew a lot of the signs - but having them in this context has put things in a new and fresher perspective for my little boy who is learning to listen to his body. My son has two Signing Time apps, 4 Signing Time music CD's and about 25+ DVR'd videos. So, yes - I love this series and this new DVD. By the way, if I ever meet Rachel, I'll likely embarrass myself big time. LOL. Just yesterday I had a friend ask me about the benefits of teaching a baby/toddler ASL. It was a great discussion. Please click here for Benefits of Learning ASL as a baby/toddler. Giveaway will end August 17 at 11:59 pm. Sponsored by Potty Time. I received samples for review. No other compensation was received. All opinions are my own. This promotion is in no way sponsored, endorsed or administered by, or associated with, Facebook. We hereby release Facebook of any liability. Winner(s) will be contacted by email and will have 48 hours after the giveaway ends to respond before another winner is picked. I like that their products are "satisfaction guaranteed"! I love all the videos! We're huge Signing Time fans at our house! I love signing time. We have several of their DVDs. Agreed the videos are great! my daughters not a big talker yet so i like that they teach signs and dances and other means of communicating. I like that the site is colorful and the approach to potty trng is fun. Also like they have a community board! I like that they believe that children learn best by having fun. Like the potty training tips and the fact they use Ms. Coleman as my granddaughter always dances to her songs when they come on Nick Jr. I like that the customer's satisfaction is guaranteed. We love love love signing time at our house! 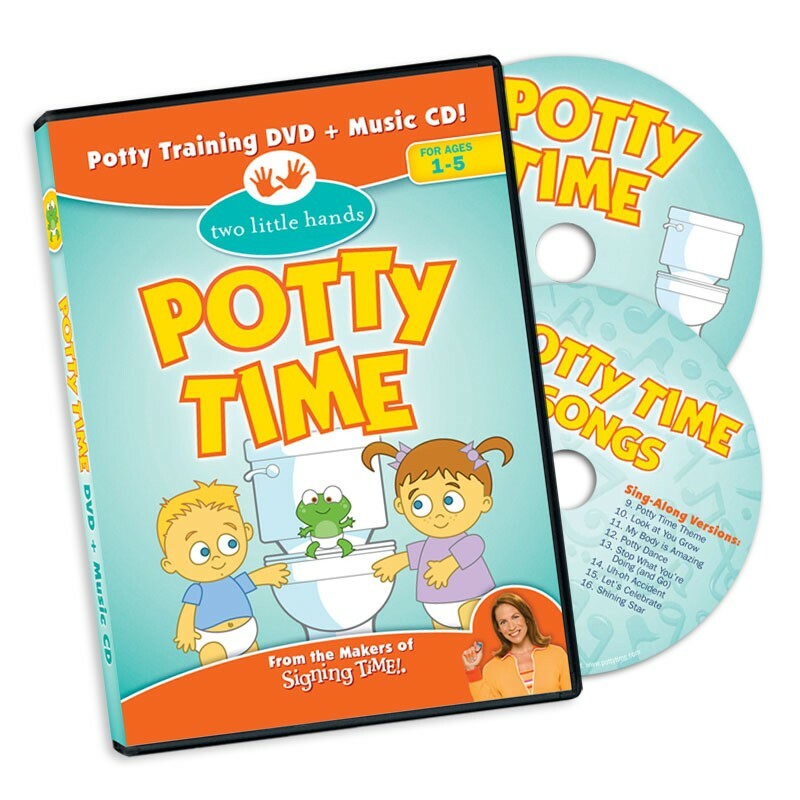 I'm so excited about this DVD and can't wait to show it to my 18 month old who will be potty training before too long! I like that there is a community help section on the site to connect parents of potty trainees! We purchased Signing Times and have several of the DVDs, this one sounds as great as all the others are! I love the potty training tips! I have 2 in diapers and could use any and all tips! Love the singing. Children can learn so much while having fun singing and dancing. I like that Rachel Carlson us an Emmy-Nominated Host. kristiedonelson(at)gmail(dot)com Thank you. I love Rachel Coleman. My son already knows her from signing time.